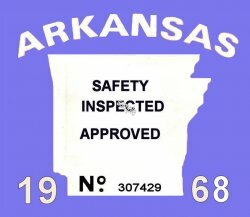 1968 Arkansas safety check inspection sticker - $20.00 : Bob Hoyts Classic Inspection Stickers, Add a Final Touch to your Restoration! This 1968 Arkansas Inspection sticker has been digitally restored and reproduced based on the memory of one of our customers. It is identical in size and color both front and back to the original to the best of our knowledge. It has our patented "Peel and Stick" Format so it can adhere to the insde of your car windshield.